I did post earlier in my blog posts that Google in partnership with Intel, Sony, and Logitech is developing Google TV, a device based on Android OS. 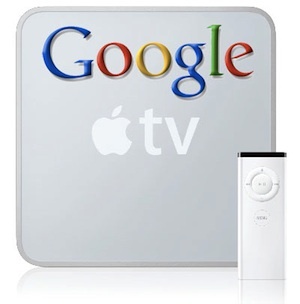 The good thing about Google TV is that the search giant is going to push developers to create apps for a television set. That sounds interesting and it’s a whole new idea as there are no official iPhone apps running on Apple TV. Beginning this fall, select home entertainment devices will bring Google into the living room. The appropriately named “Google TV” Internet-enabled TV platform will come preloaded on some Sony HDTVs and Blu-ray players, and a set-top box from Logitech will also feature the service. Think of the platform as an Android-like solution for television watching. It won’t be sold directly by Google, but if the company has its way, Google TV will be making its way to a much wider variety of home entertainment products in the not-so-distant future. With Google on every TV, there’s no need to adjust component settings just to watch your favorite show on Hulu or update your Twitter feed. You’ll also only need to worry about getting one device online—your television—rather than adding (and paying for) extra peripherals. It’s important to recognize that while Google TV will be initially available through a set-top box from Logitech, Google’s ultimate intention is to simplify your Internet-connected living room, by decreasing the number of devices you need to buy and use, not by adding more. There will still be plenty of questions about Google TV, but check out the chart below for a summary of the features and how Google’s TV platform will compare to video devices already on the market. 10 Alternatives to Google Search Engine !! We know Google is clearly a dominant front runner accounting to 60 percent of all web searches in the world, there’s lot of reason that Google leads the pack when it comes to search. That said, if you’re performing all of your searches through a single search engine, you’re missing out on a lot of results. The site does a lot of things right, but there’s still a lot of innovation happening in the search space outside of Google. Take Bing, for starters. It’s the first new site in a long time that could genuinely be considered competition for the long dominant Google. 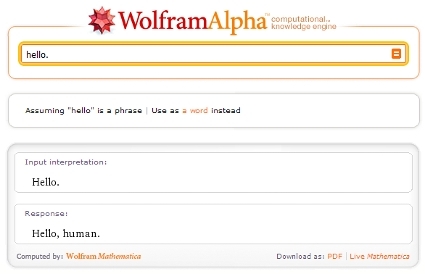 Then there’s Wolfram Alpha, which, contrary to popular belief, was never really intended to be a Google killer at all. A handful of the sites (Quintura, Carrot2, MrSapo) are really good at one thing, which likely means that the fine people at Google won’t have to worry about job security at any point in the near future. So need a break from Google? 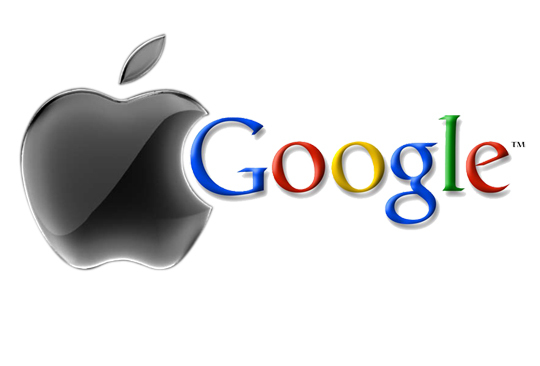 Check out these Ten Google alternatives. If you didn’t get a chance to read John C. Dvorak’s recent column, allow me to distill one important point: Microsoft has always been good at “copying and improving” products. Now, Dvorak also makes a point to say the company hasn’t been particularly great at this in the past couple of years, but I think there are at least two notable exceptions. The first is Windows 7. The second is Bing. One can certainly argue the merits of Microsoft’s “improvements” (particularly in the case of Bing), but the company is certainly doing some interesting work in the space. In typical Microsoft fashion, the company has completely eschewed Google’s stark simplicity in favor of cramming as many features into a results page as possible. When I don’t get results in Google I go for Dogpile, each search engine has its own method of searching and each will return different results. Dogpile looks at all of them, decides which are most relevant to your search, eliminates duplicates and reveals them to you. In the end, you get a list of results more complete than anywhere else on the Web. 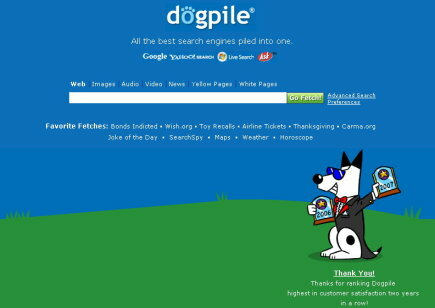 Dogpile aggregates the most relevant searches from Google, Yahoo!, Bing, and Ask and delivers them to you in a convenient search package. With Dogpile, you get the best from the big dogs without all the mess. Wolfram Alpha utterly baffled a lot of users upon its launch. In the on-going search for a “Google killer,” a number of bloggers embraced this little startup search engine with a strange name when it was first announced in March of last year. When the search engine actually launched, however, no one really seemed to understand what to do with the thing. That’s because Wolfram Alpha is not Google-not even close. Don’t visit Wolfram if you want to find out the location of the nearest Whole Foods, or you need to know when and where Hot Tub Time Machine is playing. If you need to calculate your mortgage or find out the life expectancy of a resident of Botswana (61.9 years), Wolfram Alpha is the place to go. Wolfram Alpha is all about structured data, not unfiltered information. A relatively new service, Wolfram Alpha is still a work in progress. The site’s potential as a source for accessing numeric data, however, is clear. It’s not that bad, bet me. originally, Yahoo! Search started as a web directory of other websites, organized in a hierarchy, as opposed to a searchable index of pages. What I like about it is features like Yahoo! selection-based search feature called Yahoo! Shortcuts, service called “Build Your Own Search Service,” or BOSS, which opened the doors for developers to use Yahoo!’s system for indexing information and images and create their own custom search engine, and ability to search across numerous vertical properties outside just the Web at large. These included Images, Videos, Local, Shopping, Yahoo! Answers, Audio, Directory, Jobs, News, Mobile, Travel and various other services as listed on their About Yahoo! Search page, which is pretty cool. 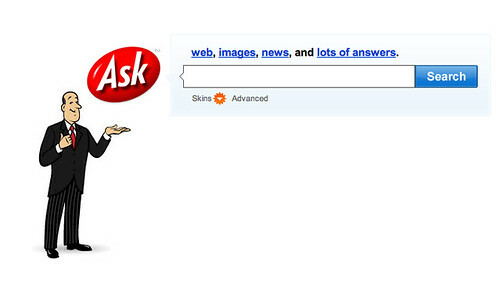 Ask.com (or Ask Jeeves in the United Kingdom) is a search engine founded in 1996, I started to love it in 2006, Ask implemented a “Binoculars Site Preview” into its search results. On search results pages, the “Binoculars” let searchers capture a sneak peak of the page they could visit with a mouse-over activating screenshot pop-up, honestly this created a trend in the web world and then the AskEraser feature, allowing users to opt-out from tracking of search queries and IP and cookie values. They also vowed to erase this data after 18 months if the AskEraser option is not set. But overall a very descent and excellent one for your searches. Like a number of other smaller search engines, Carrot2’s primary selling point is its clustering, Carrot2 breaks search results into the top 100 related topics. Type in “cars,” and the first five topics are “New Cars,” “New Car Reviews,” “Sell New,” “Trucks,” and “Automobiles.” Click on any of those topics and you get a list of relevant results, with a number by each link, donating its rank in the overall search results. You can use the engine to search the whole Web, blogs, images, news, and jobs. It will also search specific sites like Wikipedia. Is it possible that there’s an even quirkier name for a search engine than Carrot2? Indeed. Say hello to MrSapo. The site is the latest in a long line of search engine aggregators, which includes, perhaps most notably, Dogpile. What MrSapo lacks in innovation, it makes up for in sheer quantity. The site offers some more traditional search engine choices, such as Google, Yahoo, Bing, Ask, Cuil, Wolfram Alpha, Wikipedia, and Twitter. Those choices (there are 23 in all) are situated at the top of the page. Enter a term in the search field, click the button for the engine you’d like to use, and MrSapo jumps to that site. That’s just the beginning. The rest of the MrSapo front page is devoted to further search categories, including Popular Essentials (YouTube, iGoogle, Weather.com, etc. ), What’s Hot (Fark, Tweetmeme, The Daily Beast, etc. ), News (Google News, BBC, CNN, etc), Magazines (Time, The Economist, Newsweek, etc), Marketplace (Amazon, eBay, Craigslist, etc), and more. There are 26 different categories in total. Viewzi is all about making search look good. This highly dynamic search engine offers 19 different methods for viewing search results. Check out the Google Timeline, Photo Tag Cloud, and Four Sources modes for some re-imagined visual search displays. The site also offers custom search for Amazon, video search, and a really cool album search mode, which displays a wall of record covers that match your search terms. Many smaller search engines are based on a niche idea. Of these, many are, at best, vaguely interesting. Omgili’s, on the other hand, will likely prove useful for users. The search engine scours message boards, communities, and discussion threads. You can refine your search based on date, the number of replies a topic has gotten, and the number of users discussing said topic. Omgili also features a cool Buzz Graph at the top of the page, showing how popular a given topic has been, over time. oh, even “Twitter” in that case, i know Twitter isn’t a search engine, per say, but there’s a reason that Bing and Google were racing to incorporate the micro-blogging site’s feeds into their search results: Twitter is the ultimate breaking news hive mind. Sure, there’s plenty to roll your eyes about on the site (go ahead, type in “Justin Bieber,”), and when it comes to news, this isn’t exactly The New York Times. But if you want to know what the world is thinking about a particular topic, the answer is just a Twitter search away. Did I miss any more leave me the comments, still then Happy week !! iPad is the new sensation now and with it iTunes App Store is filled to the brim with quality entertainment apps (Marvel Comics, Netflix, Pandora Radio, Plants vs. Zombies HD), but there are also a number of apps that can help keep businesspeople productive when they’re away from their primary computers. The highest-profile productivity app is iWork (a touchscreen version of Apple’s office suite), but there are plenty of other apps that aren’t as well-known that can prove useful to small businesses. Light Room’s GoDocs grants users the handy ability to view Google Documents in both online and offline mode—perfect for when your iPad can’t connect to a wireless signal (either due to you being unable to find a hotspot, or to the iPad’s own Wi-Fi issues). GoDocs has folder support, and files can be sorted by type, name, or creation date. The app also has a “revisions” button for accessing older versions of a file, so you can always turn back the clock when needed. Sharing files with colleagues is an important part of any business, and, fortunately, GoDocs makes the process simple: you can download Google Docs to the iPad and send saved files by e-mail, or share files to a Wi-Fi network. A great tool for webmaster, marketers, and SEO gurus, Inblosam’s Analytics HD is a nifty iPad app that works with Google Analytics to let you check out your Web site’s vital metrics. You can view easy to read charts and reports, and tap the “Today” and “Yesterday” categories for quick analysis of vital statistics. Analytics HD supports multiple logins and accounts, and lets you easily switch between them for quick comparison. Avatron Software’s Air Sharing for the iPhone was such a useful app that it earned some cool Awards so far, and now the iPad version of the app is available to help your iPad wirelessly access files from a Linux, Mac, or Windows computer on the same Wi-Fi network. Air Sharing HD mounts as a drive, so it supports drag-and-drop file transfers between a desktop and iPad. In addition, Air Sharing HD also gives you the option of wired connectivity; simply connect a docked iPad to a Mac or PC via USB for speedy file transfers. 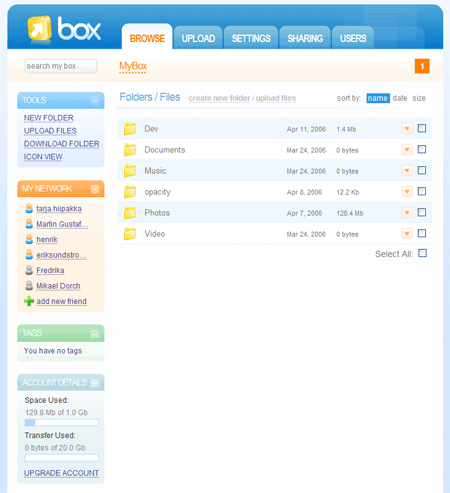 You can connect to it from a Web browser, and use it to host a web server using WebDAV. More than just online storage, Box.net’s iPad app has robust collaboration features. Not only can you view Microsoft Office files, PDFs, and Box Web Documents, but entire folders can become shared online workspaces where others can view, edit, or add files. An update monitor keeps track of file changes, and informs you of files that have been previewed or downloaded. The free account allows for up to 1 GB of online storage, but the Business account serves up 15GB of online storage per user at a rate of $15 per user per month. If your organization is running Citrix XenDesktop or XenApp software, it’s possible to turn the iPad into a full virtualized desktop. Citrix Receiver for iPad provides one-touch access to corporate desktops, Windows applications, and complex database and 3D applications. If you’re worried about security, don’t fret; the connection is secured, so communications and information are not stored on the iPad, but stored remotely and kept within the confines of the corporate network. MobileIron’s Sentry on the iPad is a tool for IT administrators to gather information about the increasing influx of mobile devices (like the iPad) on corporate networks. This app offers sophisticated monitoring, such as the ability to view devices and users by connection frequency, which is a good way to get a mobile view of network trends. Users can view potential threats and block end-users’ devices from the network. MobileIron gives the ability to remotely “wipe” stolen, lost or compromised devices as well, so sensitive information doesn’t escape into the wild. Roambi’s iPad app provides a graphically-rich way to access, store, manage and refresh mission-critical business data by transforming enterprise data (everything from Excel spreadsheets to Salesforce.com data to SAP Crystal reports) into stunning, interactive visualizations designed for the iPad’s screen. This data is displayed as secure, interactive dashboards, and you can even create your own custom dashboard with Roambi’s Publishing service. Roambi also includes several new trending and comparative analytic features that are designed to take advantage of the iPad’s large 9.7-inch display. Yes, it’s a pricey app, but LogMeIn’s iPad app gives business users remote access to any Mac or PC that has LogmeIn software installed, which is extremely useful when you need to access a file on your main computer. The app locally stores encrypted passwords to each host computer, and it has been tailored for use on the iPad for faster performance and improved navigation. FMWebschool’s FMTouch brings the popular database application to the iPad, including many of the same features that made the program FileMaker a success in the desktop space. Users can create reports, run scripts and edit, create, or delete database records. 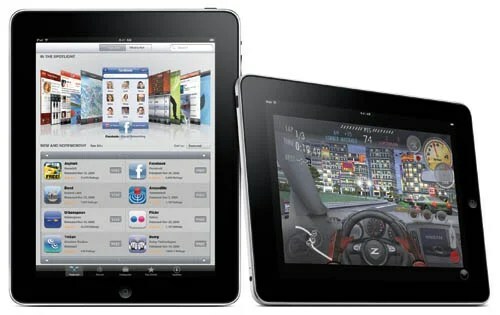 The app lets you run multiple related FileMaker databases, or wirelessly sync the iPad with FileMaker database software running on a computer. So there you go some cool Business Apps for the Apple iPad, if there are any missed please leave them in the comments below, I will definitely review it….